At Moor Park House and in the Watling Care Centre we have a particular approach to the delivery of our nursing and care services. We recognise that each person using our services is in a phase in their life when it can be beneficial to receive professional nursing and care support to maintain and enhance their abilities. Each person is individually assessed in a holistic way to ensure we can recognise and meet their needs, be they medical, physical, nutritional or social. Each person’s care pathway is supported to promote wellbeing; small gains can make a big difference to one’s quality of life. When you enter Moor Park House you quickly notice the friendly, homely and supportive atmosphere. The staff team are always positive and respectful, whilst enabling residents and patients to improve and uplift their physical wellbeing, mood and spirits. The Moor Park House way is always a rehabilitative approach to care and living that aims to be uplifting. Attention to the small and everyday things is key to care at Moor Park House. Life can be a struggle with big and small difficulties but this is where our skills, talents and training can support our clients to achieve health and personal gains in wellbeing. 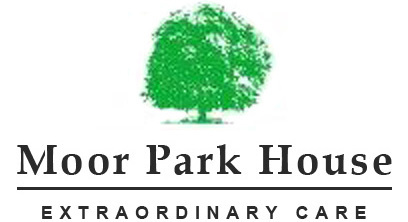 Moor Park House delivers intensely personal and private services with professionalism and humanity. Through treating people as individuals with individual care plans, goals and needs we aim to maintain each person’s skills and abilities to function as well as possible.